Using Mathematica to read .HDF (not .HDF5) metadata? I am obliged to work with existing .HDF files. These contain metadata essential to my research that Mathematica (latest version) appears unable to access. 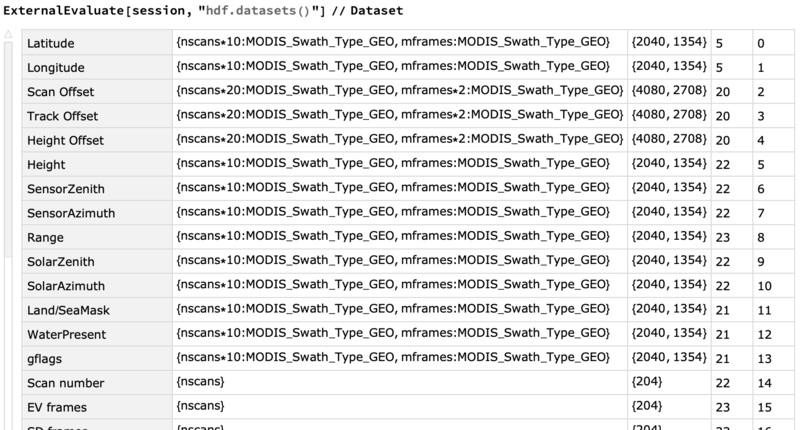 Metadata listed on https://reference.wolfram.com/language/ref/format/HDF.html as being accessible are "Datasets" and "Dimensions", which I have read successfully. However, there are others such as, in my specific case, ""actual_range", "metrics" and "_Fill_Value" amongst others that I haven't been able to access. Is there a means within Mathematica to access all metadata? HDF5 files are better supported, however project data is unavailable in this format. The easiest way to do this is by passing off all the actual work to python. This requires that you have a python environment that has pyhdf installed. Honestly, the bulk of the work is going to be actually installing pyhdf, and I'm afraid that I can't help you there. Assuming that you do have a python environment with pyhdf installed, the rest of this answer is for you. What's going to happen is we're going to ask pyhdf for the results using ExternalEvaluate. If you've used python before the code is actually very simple. Here I'm linking the session to my local python install that has pyhdf installed. If you got pyhdf using conda or similar, you'll want to find what the right path is for your executable. And now we can for instance read information about the datasets in the file. This returns a native Wolfram Language association. Fantastic. Well, there's your question answered, really! Not the answer you're looking for? Browse other questions tagged import or ask your own question. How can I read compressed .Z file automatically by Mathematica? Read a compressed ascii data file?